Greenville, NC, provides end -of-life care in the spacious eight-bed house with the comforts of home. The Memory Tree sculpture that is on the entrance wall is made up of bronze, aluminum, and copper leaves that can be inscribed with the names of those who have passed away at the Hospice House. Family members or friends who want to honor the memory of those people who were dear to them can purchase a leaf to memorialize their loved one. Service League members set tables on the fourth Thursday of each month to serve a meal to all Hospice House guests. Gail Joyner, Donna Moore, Beth Beasley, and Betty leRoux served a meal in February. Ellen Crawley, Anna Fay Campbell, Mary Lou Cherry, and Barbara Bowser served guests in March. Our current Chairperson, Betty leRoux, provides sign-up sheets on the back tables at the general meeting for members to sign up to serve a meal. In case you missed the celebration of the 10th anniversary of the Hospice House last October, here is a recap with member Martha Bloss, Chair of Hospice House last year. On Thursday, April 11, 2019, Hospice volunteers were honored for their service. Memory Bear workshop is scheduled for May 11, 2019. Sewing experience is NOT required. 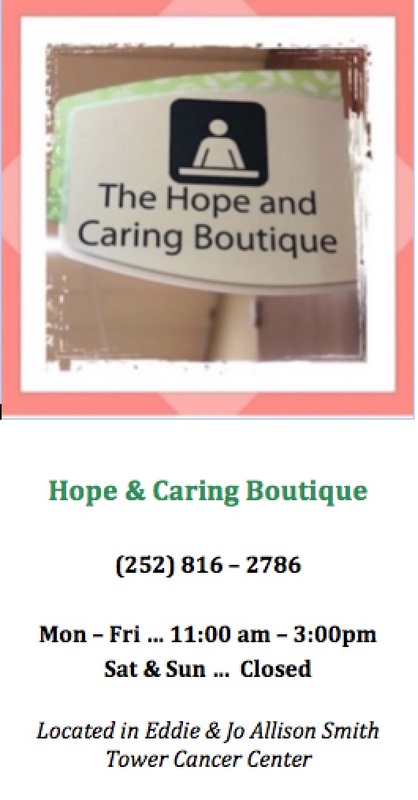 For more information on the Hospice House, contact Angelina Brittle at 252-847-0879 or Crystal Corbett, Vidant Health Foundations at 252-847-1230. 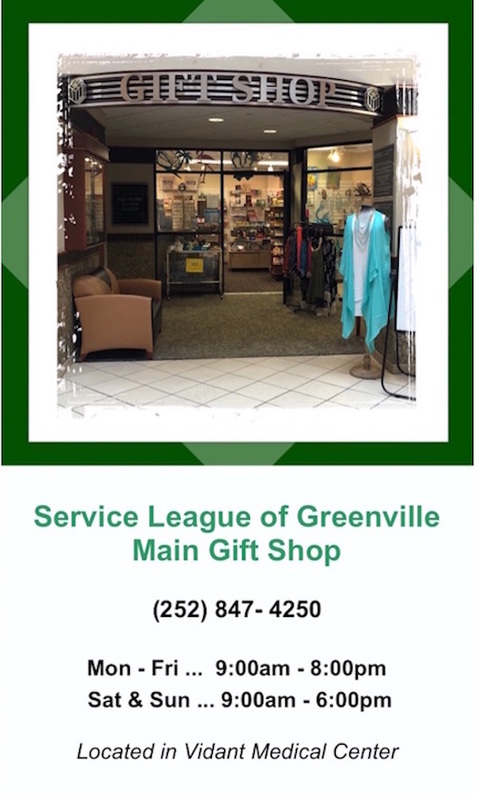 In the first edition of the 2019 City Flare Magazine, one can read and learn a bit of history about the three gift shops run by the Service League of Greenville. The article was comprised and written by Cassie Causey and Kim Sayers who are League members and also members in the Communications Committee chaired by Susan Thornton. Find copies of City Flare Magazine at local businesses around town and come visit our gift shops! On Saturday February 23, 2019, the Service League of Greenville 56th Annual Charity Ball was held at Rock Springs Center. Thanks to the efforts of Chairpersons Marcia Pleasants and Theresa Warren and the Charity Ball Committee, approximately 280 guests attended the Ball and danced to live music by The Embers. Busy bees in the month of February 2019! 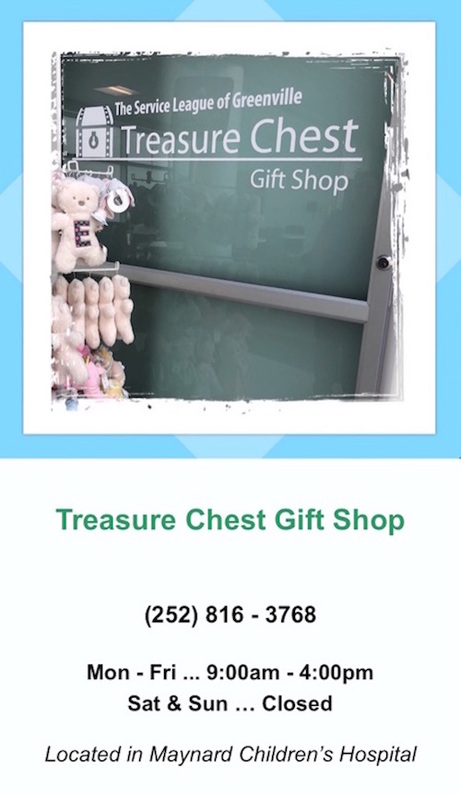 It was so busy and sales were flying off the shelf at the Vidant Main Gift Shop on Valentines Day. We had time to take only a few pictures in between the wrappings! And of course our biggest event of the year, the Annual Charity Ball is on February 23, 2019. Chairs Theresa Warren and Marcia Pleasants and all the committee members are making the final details and decorations for “An English Country Garden”. It’s been reported that the Queen herself may be there! You wouldn’t want to miss it! Under the leadership of Gwen Gordon, our Special Projects Committee has been making the rounds! Delivering crayons, activity books, and coloring books to Vidant Hospital are members Carol Rados and Brenda Whichard. These supplies will be used by the children who are at the hospital but are not allowed to go into visitations. The purchase of these supplies came from the sale of dog chews which is a spinoff of the Blanket Workshop Project. Here is another delivery of supplies to the Creative Living Center. Members donated paper products, trash bags, magazines and other items at the February General Membership meeting. These supplies are much needed and appreciated by the Creative Living Center staff. Our thanks to all the hard work by the Special Projects Committee! It’s that time of year again and it has come around fast! Service League ladies hand addressing hundreds of invitation envelopes to The Laughinghouse Fund Charity Ball. Our thanks to all who dedicated a morning to this endeavor as it is done with care and love. The Service League of Greenville’s 56th Annual Laughinghouse Charity Ball is on February 23, 2019. The theme is — AN ENGLISH COUNTRY GARDEN! Our annual Christmas Tea in the month of December is once again, colorful and bright. Rita Galbraith presents her report and shares the beautiful blankets that her committee is making for patients and families. We are honored to have coffee in a silver set that was owned by member Connie Bond. Please extend my gratitude to the membership for helping to make the Christmas Tea a success again this year by bringing holiday goodies. I particularly want to again recognize Jamie Kirby and Marcia Pleasants, my trusty assistants; Earlene Hite , who not only arranged the exquisite flowers but donated them as well; for sustaining members Kathy Beckman and Laurie Charlton who served beverages; and last, but not least, Annelle West who helped set up and navigate the church kitchen. She also took the linens home to laundry. Terrence Clemons was invaluable! And such a gentleman. I am donating any expense I encountered for cups, plates, napkins, supplies, coffee, cider, etc. So, as far as I know there will be no expense for the tea to the League. I hope the provisionals will continue to be “lit “with the love shown them during this welcoming tea. There is just so much talent in the League and in the November meeting, we were entertained by our past president, Annelle West’s singing and guitar. We wish everyone a merry Christmas and a wonderful holiday! A delivery of 12 Layette bags was made on Nov 6 to both The Brody School of Medicine OB/GYN Department and Public Health Baby Love program. Another remaining 12 layette packages were delivered to Carolina Pregnancy on Wednesday. The organizations were extremely appreciative of the generosity from the members of the Service League of Greenville. The donated baby supplies and clothing will be distributed for use in our local community. Thank you to Rita Galbraith for organizing the collection and delivery of these items! Service League of Greenville volunteers were hard at work in the month of — September 2018. Total -— 1400.5 hours of service to our community! The Service League was publicly recognized again by Vidant Health in a full page ad in The Daily Reflector on October 14 and October 21. Pictured in their Service League coats, from left are Kim Lewis, Fran Best, Bonnie Porter, Karen Gagnon, and our website designer, Linda Anselmi, who will be greatly missed due to her relocating in November. We are appreciative of this ad and the continued support and partnership with Vidant Health.